At least 22 people have now been reported killed in a siege by gunmen at Kabul's Intercontinental Hotel, the health ministry says. The attack ended more then 12 hours after gunmen in army uniforms entered the hotel around 21:00 local time (16:30 GMT) on Saturday. The Taliban said their fighters were behind the attack. Sources told national news channel, Tolo News, that the death toll could be as high as 43. Some 160 people were rescued after Afghan troops fought through Saturday night to regain control of the building. The gunmen - armed with rocket-propelled grenades as well as smaller weapons - took many of the guests hostage. "They were shouting... 'Don't leave any of them alive, good or bad. Shoot and kill them all," a guest, Abdul Rahman Naseri, said. Several guests were pictured using bed sheets to try to climb down from a top-floor balcony. All six attackers have reportedly been killed. Kabul police told the BBC that nine Ukrainians, one German, one Greek and one Kazakh citizen had been confirmed dead. Two other foreigners have yet to be identified. 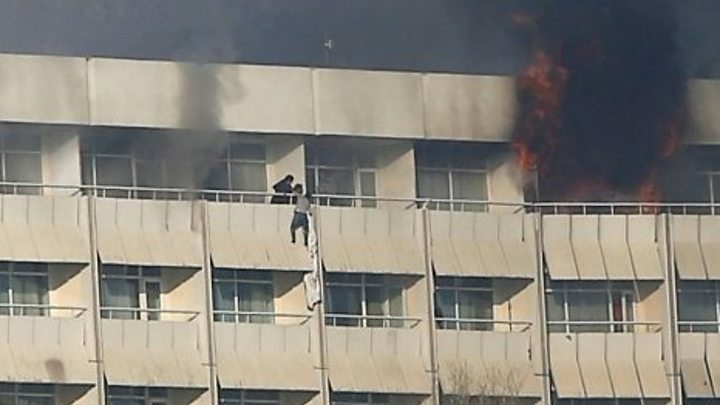 The Taliban also attacked the hotel in 2011. Security has been tightened in Kabul since last May, when a huge truck bomb killed at least 150 people. However, there have been several attacks in recent months. They include a bomb at a Shia cultural centre last month that killed more than 40 people. Are you in the area? If it is safe to do so, you can share your experiences by emailing haveyoursay@bbc.co.uk.